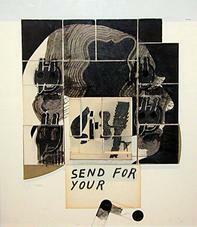 Ray Johnson, Untitled (Send For Your), collage on masonite, 16 by 13-7/8 inches. 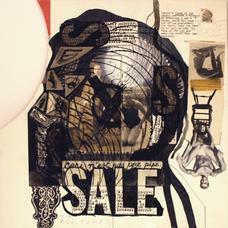 Ray Johnson, Untitled (SALE, Ceci n'est pas une pipe), collage on illustration board, 15 by 15 inches. The Directors of Blain|Southern are delighted to announce the group exhibition SED TANTUM DIC VERBO (JUST SAY THE WORD), conceived and curated by the American writer and editor Glenn O’Brien. The exhibition examines the use of words in art and brings together artists from the 1960s to the present day who all have/had a strong relationship to the curator. Glenn O'Brien describes his personal selection: "The transformation of the media landscape over the last half-century created a revolution in communication, not merely mass communications, but how individuals perceive the world and express themselves in return. Visual collage fields and holistic perception replaced literary linearity and its logical bases. The immutability of the written word was overshadowed by the instant mutations of oral speech. As an unexpected consequence words began to appear in formerly pictorial frames, as if language itself had become an unfamiliar landscape requiring reappraisal and transformation." For more information, visit Blain Southern here.